Tinuvin® XT 847 FF by BASF is hindered amine derivative. It is a novel NOR-HALS based high performance light stabilizer system that represents a significant advancement in light stabilization of polyolefins, especially for flexible TPO compositions used in membrane applications. 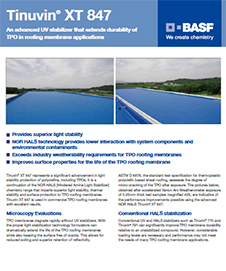 In addition to the superior weatherability, it imparts thermal stability and surface protection to TPO roofing membranes while providing lower interaction with system components and environmental contaminants. Enhances the durability of TPO membranes by retaining its surface and physical properties. The main advantage is that it significantly extends the life of the membrane with lower concentrations than other light stabilization systems. 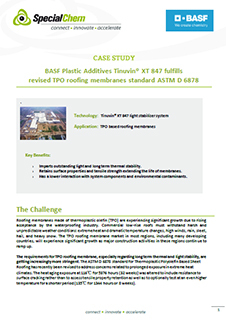 Tinuvin® XT 847 FF is highly recommended for building and construction TPO exterior roofing membrane and geomembrane applications. Its usage level is 0.05 and 0.5%, depending on the substrate and the performance requirements of the final application.